As single issues go, Checkmate #16 is very near one of the best issues I've ever read. As the first chapter of Checkmate: Fall of the Wall, it's just another example of how Greg Rucka's writing just gets better with each passing moment. It's a pity, indeed, that Fall of the Wall represents the end of Rucka's run on Checkmate; dollar for dollar, this is surely one of the best trade paperback collections out there. The first chapter of Fall of the Wall, "Past Perfect," focuses on relationships, both the origin of the romance between Sasha Bordeaux and Mr. Terrific, and the friendship between Fire and the newly resurrected Ice. From the opening pages, where Rucka reveals that Mr. Terrific is the only person whom Bordeaux's OMAC programming doesn't show her predetermined ways to kill, to the quiet panel of Fire and Ice's embrace (with award-deserving art by Joe Bennett), "Past Perfect" demonstrates to the reader just how much we've grown to care about these characters. Regarding Fire and Ice, especially -- Gail Simone may have brought Ice back, but Greg Rucka really makes us feel the joy of the moment. Much as I enjoyed the trade as a whole, I found the main story here, "Fall of the Wall," a bit anti-climactic. Given that most Internet-laden readers already have a general sense of what Salvation Run is about, the revelation that Amanda Waller's been sending villains off-planet is no big shock; additionally, the game-changing that the other Royals do to Waller comes very swiftly in the last few pages. What I did like about "Fall of the Wall" was the way Rucka used it, as he has with many Checkmate stories, to at the same time reveal tidbits about the Bishops and Knights who work under the Royals; I think having the August General around provides some terrific tension, and Jessica Midnight's magic powers are also very interesting. What I love about Checkmate is the sense you get that Rucka is working with a paintbrush that includes the entire DC Comics universe, and this shows strongly in Fall of the Wall. Not only is the new White Queen a former member of the Doom Patrol, her knight a Rocket Red, and her Bishop an Outsiders villain, but the role of Castellan for the Checkmate castle goes to Master Jailer, late of some early 2000s Geoff Johns Superman comics. And the cameos! There's no less than Dr. Mid-Nite, Ice, Martian Manhunter, and Oracle here--even Detective Chimp gets an off-screen mention. I can't help but think this kind of thing wouldn't have been possible pre-Infinite Crisis; as in Brave and the Bold, I just love that the DC Universe can team up again. Rucka rounds out Fall of the Wall with a one and two-part pair of profile issues (with assists from writer Eric Trautmann), one on Master Jailer and one on the Black Queen's Knight, Mademoiselle Marie. Even if these slow the book's progress a little, they're both entertaining (and chock full of guest stars). I especially liked the look at the past bearer's of Marie's title; between the potential for Marie to have died of a gunshot wound in "Fall of the Wall," and then her nailbiting rescue attempt at the end of the chapter, Rucka and Trautmann really made me root for this character. These profile issues reminded me strongly of similar stories in Bill Willingham's Fables, and I like the vibe it gives the series. Let me tell you, I'm pretty nervous about Bruce Jones taking over Checkmate after Rucka, especially given the Nightwing: Brothers in Blood fiasco. Checkmate, if it isn't obvious, is a title I like a lot, and I'm not eager to see it go by the wayside. We'll see. On to Booster Gold now, and then Green Lantern: The Sinestro Corps War. Be there! 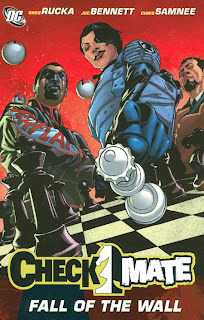 "It's a pity, indeed, that Fall of the Wall represents the end of Rucka's run on Checkmate..."
Not true. The final story arc of Greg's run of the series (which I was fortunate enough to help write) is "Castling" (issues 23-25), which should, theoretically, be included in a fourth and final Checkmate TPB. In addition, we get another whack at Checkmate in FINAL CRISIS: RESIST in October. Thanks for the kind words; they're much appreciated! Eric -- Thanks for your comment. I had thought the solicitation for Checkmate: Chimera didn't include "Castling," but I'd be very glad if it did! And kudos again for the Castellan story; I enjoyed Geoff Johns take on Master Jailer in Superman, and I was glad you and Greg brought him back, remembering his daughter as well. I was doubly sorry to see Checkmate had been cancelled -- but a Checkmate presence in Final Crisis: Resist is a nice substitute. Hope you'll stop back for our review of Chimera. Thanks again. Master Jailer? He was locking up supes in the 70's! Yes, but the Master Jailer in question here is specifically the post-Crisis Master Jailer, whose conflict with his daughter factors into the Checkmate story. This particular iteration of the character was created by Karl Kesel and called Deathtrap in the 1990s, but Geoff Johns renamed him Master Jailer in the Ending Battle story in the 2000s (in homage, as you say, to the pre-Crisis character). Thanks for stopping by! Trade Perspectives: Best Online Comics Shop?